It is a huge volume, taking the form and preoccupations of a Victorian blockbuster, but with a modern perspective and use of language. In particular, there is a frank treatment of the sexual content – the subtext for many a Victorian novelist but never addressed directly. Although the book has over 800 pages, it does not seem excessively long and it kept me fully involved and reading avidly for several days – a tribute to Faber’s writing and research. He brings the reader into both the highest strata of Victorian society and the most miserable and deprived slums. There is a wealth of detailed description of places and smells — whether talking about perfume manufacturer or slum sewers — which almost make a reader feel as if they are physically present. The plot is strong and the characters (both central and peripheral) well developed and convincing. The style is on one level designed to mimic a Victorian approach, but at the same time acknowledges and challenges (openly) the expectations of the modern reader, who at times is addressed directly as an explorer of a mysterious and undiscovered land. 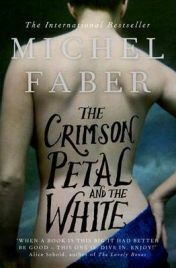 Faber’s novel features two central female characters, Sugar (The Crimson) and Agnes (The White). Sugar is a strong yet “fallen” woman, a highly intelligent prostitute who hates her life and has a burning drive for improvement. Agnes is weak, unable to deal with sexuality and as a consequence frail and mentally unstable. William Rackham is the pompous and rather dim Victorian patriarch who is caught in the middle, and manipulated by both women in different ways with limited self-awareness. As a reader, my sympathies of lay entirely with the female characters. As a result of the length of the novel, there is also plenty of opportunity to develop the minor characters, many of whom are interesting and amusing in themselves. This is something which is much more apparent in the book than in the television adaptation. In many ways this is a book about female strength and male weakness, despite which a patriarchal society continues to flourish. In his first novel (Under the Skin), Faber tells a story of a mysterious attractive female car driver who picks up male hitchhikers, turning on its head the typical stereotype of many crime novels with an unusual twist, and The Crimson Petal and the White addresses similar territory in a different way. I very much recommend this book to anyone who is attracted by the idea of a Victorian drama with modern morals, or who enjoyed any of Sarah Waters’ early books. No Comments on "The Crimson Petal and the White"